Rugby World Cup Limited (RWCL) has announced that Canon, a world-leader in imaging solutions, has joined the family of Rugby World Cup 2015 official sponsors. The deal represents the first time that Canon has partnered with rugby’s showcase event, underscoring the strength and appeal of the Rugby World Cup brand in the global sponsorship marketplace. Brett Gosper (left), CEO, World Rugby and Managing Director, Rugby World Cup Limited, pictured with Rokus van Iperen (right), President & CEO, Canon Europe, Middle East & Africa on the announcement of Canon as an official sponsor of Rugby World Cup 2015. 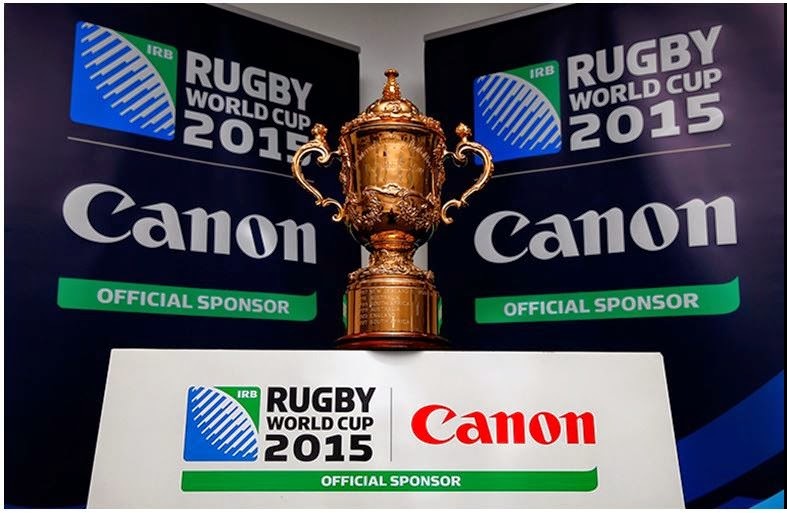 During Rugby World Cup 2015, Canon will be undertaking a range of activities as an official sponsor, including providing print and copying solutions used by the tournament organizers. Canon will also be working with Rugby World Cup Limited to deliver a range of image-related initiatives to enhance the spectator experience during the tournament. The Canon Professional Services (CPS) team will be on-site sharing their imaging expertise and helping professional photographers to get the perfect shot throughout the tournament. The dedicated team of CPS technicians at Rugby World Cup 2015 will provide accredited professional photographers with advice, essential maintenance services, equipment loans and help with minor equipment repairs. Canon’s support of Rugby World Cup 2015 represents a further boost to the commercial programme – the announcement of Canon’s sponsorship follows the appointment of Heineken, Land Rover, Société Générale, DHL, Emirates and MasterCard as Rugby World Cup 2015 Worldwide Partners, Gilbert as Official Ball Supplier, Canterbury of New Zealand as Official Sportswear Supplier, Clifford Chance as Official Law Firm, EY as Business Advisor and Sportfolio as Master Licensee. The Rugby World Cup 2015 will be hosted in England between 18 September and 31 October 2015 and will be a celebration of rugby and its unique character-building values, exciting and inspiring the nation and the world to play and support the game. England Rugby 2015 is the organizing committee for Rugby World Cup 2015 and will deliver the six-week tournament, hosted in 10 English cities and in Cardiff, Wales. 13 match venues will play host to the 48 games that will celebrate and engage more than two million spectators, including more than 400,000 international travelling fans.